This is the first of a comprehensive new 3-part series on radiation, which will be published on BNC in weekly instalments. If you really want to distinguish science fact from science fiction on the many vexed issues surrounding radiation, including cancer risks, genetic and physical mutations, and the biological legacy of exposure to acute or chronic ionising radiation, then read on. You may be surprised. The cartoon below comes from 1953. This was the year the molecular structure of DNA was finally nailed. Over the next few decades it became clear that the cartoon was rather more fi than sci. Not knowing this in 1953 was forgiveable. In the following year a 16 year old Helen Caldicott, who went on to become one of the world’s great anti-nuclear zealots may well have been mesmerised by Hollywood’s highest grossing film of 1954, Them!. Perhaps she cowered before the celluloid images of 18 foot mutant monster ants, supposedly generated by nuclear radiation from the Trinity nuclear bomb blast in New Mexico. Now almost six decades on, scientists understand that such stories are neither sci-fi nor fi, but simply pure fantasy. But the last few decades of molecular biology’s leading edge is still largely hidden in journals and text books and behind some of the most complex and obscure jargon on the planet. So it’s not surprising that many people still consider the apocalyptic film and gaming genres of mumbling or murderous mutants in a radiation soaked wasteland to have at least some basis in truth. In particular both Greenpeace and Friends of the Earth talk about radiation damaging the gene pool and ripping apart the fabric of life. Is there even a micro-grain of truth behind such assertions? It’s time to confront this techno-babble nuclear fantasy genre head on. We need to update our pop-culture neuroses and consign inaccurate and dysfunctional fears and mumbo-jumbo gene pool slogans into hindsight’s overflowing dust bin of embarrassingly silly falsehoods. We need to replace them with some constructive panic over big bad stuff that really can happen. Without the necessary background, a knock out punch to a long standing myth can look just like one side of a “he said, she said” debate. So we need to go back almost a hundred years and unpack the genesis of the apocalyptic nuclear mutant myth. Busting long established myths is tough, but I’m hoping this approach will show how little evidence was present from the outset. Imagine being a young woman forcibly sterilised for the simple act of receiving an X-ray examination. This is what Eugene Fisher, the head of one of Germany’s most prestigious scientific institutions, the Kaiser Wilhelm Institute for Anthropology, was advocating in 1930. Fisher couldn’t foresee the future. In particular, he could never have envisaged the last 30 years of scientific discovery. He was stuck with antiquated concepts like “germ plasm” and “racial purity”. 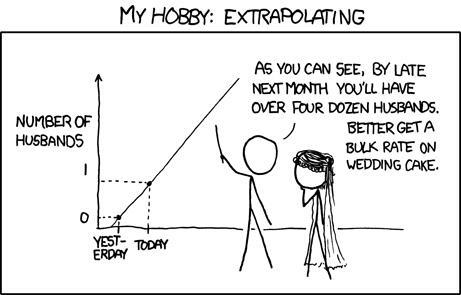 He knew that massive doses of X-radiation could cause changes in fruit fly offspring, so he extrapolated … from massive doses to tiny ones and from fruit flies to humans and got it about as wrong as this xkcd cartoon. Fisher’s thinking remains in widely voiced fears about the potential of radiation from nuclear accidents or wars to “damage the gene pool” or to disrupt the “web of life”. It’s at the heart of the 1954 Hollywood block buster mentioned earlier. Film makers from many countries have made hundreds of similar fantasy nuclear horror flicks during the past 60 years. They are still making them. It doesn’t matter how outrageous they are, film is a seductive medium that can muck with our heads and have us easily confusing fiction with fact. We have a disturbing tendency to mistake the familiar for the true. Is there a nano-grain of truth behind the 18 foot ants emerging from a radiation shredded gene pool? X-rays were discovered in 1895 and it didn’t take long to find out that they could interact with and change both plant and animal life. During the 1920s, the humble drosophila (better known as the fruit fly) was X-rayed en-masse and any subsequent mutations recorded in great detail. Nobody had any idea what a gene was in a modern molecular sense, so “mutation” in this context just meant that the little flies spawned offspring that looked different from their parents. The structure of DNA wasn’t nailed for decades, so all anybody knew in the 1920s was that if you give your drosophila the equivalent of 1,000 chest x-rays in 3.5 minutes, low-and-behold you get mutant flies. Were there any eighteen foot monsters? No. 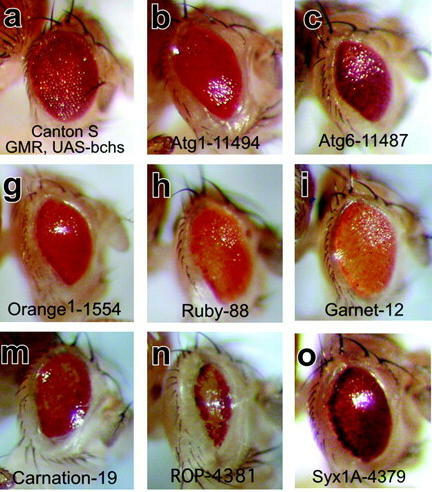 The most common mutation was fruit flies getting different eye colours or patterns like those below. I doubt that you could make a horror film about little flies with funny coloured eyes so Hollywood did what it does best, it just made stuff up. The next step in many infant sciences before anybody has a clue about the fine detail is to investigate dose-response curves. What’s that mean? Simply change the X-ray dose and watch what happens. Increase the massive dose and you get more mutants, decrease the massive dose and you get less. Plot these (always massive) doses against the mutation rate on a piece of paper it looks kind of straight. But what happened down way below this line at genuinely low doses? Was there an X-ray dose below which there were no mutations? Why isn’t that an easy question to answer? Why can’t you just keep lowering the radiation dose and see if there is a level at which you get no mutations? Because even with no radiation you still get mutations. In fact, it was clear quite early on that background levels of radiation could, at most, produce a tiny fraction of the mutations that occurred due to other natural, but as yet unknown, causes. 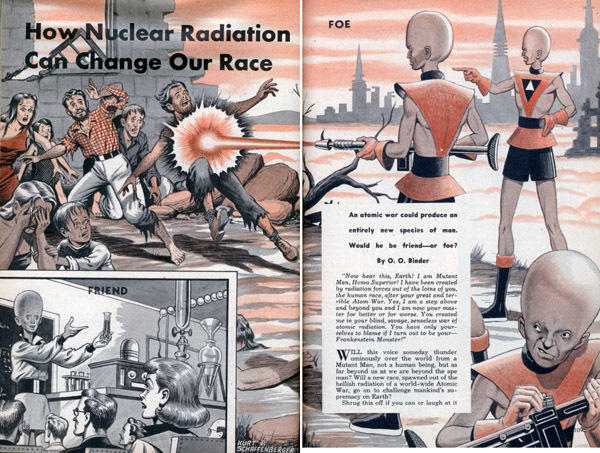 One estimate at the time was that background radiation might produce about 1 in every 1,300 mutations. So while today’s scientists are busy plumbing the mechanisms of the other 1,299 and much more besides, many people are uneasy over nuclear power because of fictional accounts of the potential of the one. Radiation is but a candle in the bush fire of risks to our DNA but it’s the only one many people have ever heard of so they give it rather more attention than its due. What causes almost all mutations … 1,299 of 1,300? Ah, ha, ha, ha, stayin’ alive, stayin’ alive. That’s right, just normal stuff like breathing, eating, drinking (even water), jogging and getting excited. Energy production in our cells generates toxic waste by-products which cause damage, not just in our DNA but in other parts of our cells and these are the basis for mutations. And when this internal waste creates too much carnage, our cells and bodies have evolved something rather like assisted cellular suicide. Over the past few decades these natural causes and rates of DNA damage have been measured with increasing accuracy and scientists can now compare them with the so-called “genetic poison” power of radiation. Everybody’s seen the twisted double strands of DNA. The image is ubiquitous. It’s generally considered that the aptly named double strand break (DSB) is the most likely type of DNA damage to result in a mutation which may then lead to something bad, like getting old or getting cancer, or perhaps even to something good as in those with a mutation to CCR5 that makes them immune to some strains of HIV. But if only a single DNA strand is broken, then cellular repair mechanisms have an easier job. But they can still screw up and a single strand break can get promoted to the double stranded variety. So, how many times would you need to increase background radiation to have it cause a similar number of DSBs to the ones produced daily by normal processes within our cells? Between 200,000 and 300,000 times. To get an idea of how big this is, think about the average radiation dose received by survivors of Hiroshima. Now get this Hiroshima dose 7 to 10 times every single day. That’s the kind of normal DNA damage your cells deal with every single day. Currently the Japanese Government forbids people to live in any area around Fukushima where they might get more than 8 times normal background levels of radiation. Researchers last year at MIT subjected mice to 400 times the background rate of radiation for about 6 months. They estimated it would add 12 pieces of extra damage every day to each normal 10,000 pieces in each cell (this number includes more types of damage than just DSBs). As far as the researchers could tell, any extra damage was completely repaired. But humans aren’t mice … and we particularly don’t get cancer like mice. We get about half as much cancer despite living 20 times longer. But I’m getting ahead of myself, part III of this series will be all about cancer. The red region is above 66 times background and everything else is below. Is there anything at all which is above 400 times background levels? Probably isolated pockets. So almost all of the evacuation region was below a level that caused no detectable DNA damage in mice and mice are far more sensitive to DNA damage than people. So let’s compare living in the evacuation zone with running on a treadmill. A 2013 study put athletes on a treadmill and ran them to exhaustion. It then did an assortment of tests, including one for DNA damage in their white blood cells. There were no problems at all in detecting damage and plenty of it. How else can I say it? Hard exercise is far more dangerous to your DNA than spending time in a radiation field 400 times stronger than global average background. Where did the damage come from? We’ll see in Part II that one of the substances formed when radiation hits cells is hydrogen peroxide. Hard running produced elevated hydrogen peroxide and this is at least one of the things which caused the damage. Let’s get back to the 200,000 fold increase in background radiation to make it match normal non-radiation DSB damage to DNA. Could you live in a radiation field 200,000 times normal? Not a chance. You’d be dead long before you had to worry about cancer or damaging the gene pool! The implications of all this is that we have DNA repair mechanisms which evolved to deal with normal stuff many times more potent than radiation. So they handle DNA damage from radiation increases far better than the rest of our bodies can handle the immediate cellular damage which would also come from such radiation mega levels. It’s all rather like sunshine. Sunshine damages DNA, including the dreaded double strand breaks, but increase its intensity 200,000 times and you’d fry long before you got skin cancer. The big difference is that sunshine at normal levels is far more dangerous than background radiation. Not only can it cause skin cancer, dehydration, heat exhaustion and death, it’s a risk for a developing fetus. More on that in Part II of the series. The bottom line? Can massive radiation levels kill us? Of course. Does that make radiation more dangerous than sunshine? Not a chance. Lastly, what’s the prospect of nuclear war or reactor accidents raising radiation levels enough to be a serious global issue? Why? Remember back to the cold war when various Governments were exploding large atomic bombs in the atmosphere? Some of these where thousands of times bigger than the Hiroshima bomb of World War II. And by how much did they raise background radiation levels? Not even once, let alone the 200,000 times you’d need to double our DSBs. They raised global radiation levels by less than 1/4 of one percent. Do the math. We could explode half a million Hiroshima sized nuclear bombs without even doubling average background radiation levels. Finland, as it happens, gets about triple the global annual natural level of background radiation and has a lower cancer rate than the UK, Australia or the US. There are some slam-dunk winning reasons to avoid nuclear war but concerns about radiation aren’t among them. In Part II of this series, we’ll look at some of the things that really can damage DNA in a significant way. This will take us a little further down the road to explaining the net result of the last three decades of biological discoveries concerning radiation, DNA, carcinogens and cancer: namely that radiation is an indolent mutagen, a comatose carcinogen, and a catatonic teratogen. In plainer English, it’s hopeless at buggering DNA, not much good at causing cancer, and a bumbling incompetent at producing birth defects. It can of course, just like sunshine, cause all three events under extreme conditions, but focusing on that brute fact is like obsessing over the toxicity of water or the probability of a tossed coin landing on its edge. Radiation measurement units are beset by subtle distinctions which are important for people operating radiotherapy machines but for more general purposes, we can simplify. Here’s some background for people used to handling units. When ionising radiation deposits one joule of energy into a kilogram of something like us, then we call it a 1 Gray (abbreviated as Gy) exposure. The Sievert (Sv) is a measure of the impact. There are various forms of ionising radiation and some forms interact more strongly with your body than others. So sometimes a single joule can have a bigger impact. But for most purposes 1 Gray=1 Sievert. An mSv is a milli Sievert, a thousand times smaller than a Sievert. 1) The number of DSBs produced per cell cycle is equal to the number that would be produced by 1.5-2.0 Gy. Average cell cycle length is roughly a day, and natural background radiation is about 2.5 mSv per year which implies that 1.5 Gy is roughly 1.5/(2.5×10-3/365)=219,000 times background levels and 2.0 Gy is 292,000 times background levels. 2) Atomic bomb survivors within 2.5 km of the blast received, on average, a 200 mSv dose. So natural DSBs are roughly equivalent to what would be caused by being within 2.5 km of a Hiroshima sized blast 7-10 times every day. 3) The Japanese Government refuses to allow people to return to areas which will expose them to more than 20 mSv per year. This is 8 times the global average background level of 2.5 mSv per year.